Beer muscles will only take you so far. Heavy-duty jobs like engine swaps, involved engine rebuilds or upgrades, crate engine installs, engine bay rehabs, and other serious jobs require real brawn. And you won’t find that brawn by looking in your beer fridge. Instead, you’ll need to look around for a good quality engine hoist. Hydraulic engine hoists are the most common types you’ll find at places like Summit Racing. 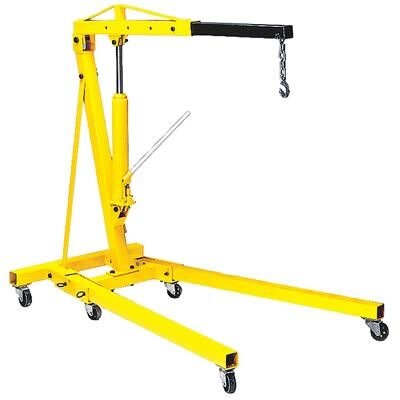 These hoists consist of a set of legs, an upright frame, and an adjustable boom with a chain and hook. As the name suggests, hydraulic hoists incorporate a hydraulic bottle jack to lift and lower the load. You typically insert a jack handle at the bottom of the unit and manually pump the jack to increase hydraulic fluid pressure. This raises the hoist’s boom, which holds a grab hook to attach to the engine itself. Hydraulic lifts roll around on casters, so they’re more mobile and versatile than other jack designs. However, depending on the type of hydraulic hoist you choose (more on that later), they can take up more garage floor space than other hoist styles. They also require flat, stable ground in order to be used safely and effectively. The next most popular hoist style is the chain hoist. The chain hoist uses a gear system and a set of chains to multiply lifting force. By manually pulling on one chain — the hand chain — it activates the gear system and begins the hoisting process. This gear system includes various-sized sprockets and uses its gear ratio to multiply the lifting force as its applied to the hand chain by the user. A chain hoist has a ratchet or braking system to prevent the attached parts from lowering when the hand chain is not being pulled. Like the hydraulic hoist, a chain hoist has advantages and disadvantages. It is generally the least expensive option when buying a hoist and the design requires limited maintenance. However, the design is also the biggest disadvantage of a chain hoist. That’s because chain hoists must be mounted to a fixed point above the lifting area. This may require you to make a special ceiling mount or some sort of scaffolding if you’re using it outside. Installation can be tricky. This Smittybilt electric hoist is actually used for removing Jeep hardtops. Electric hoists are the least popular type of hoist for lifting engines. 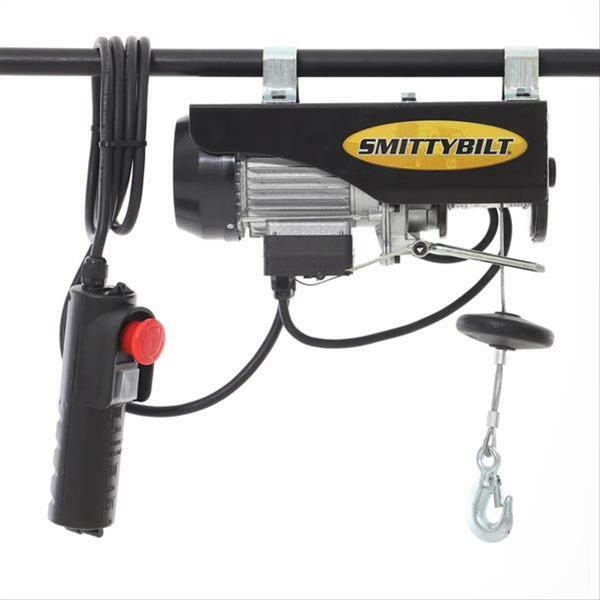 Although you’ll find electric hoists in some automotive shops, you’re more likely to find them in factories and warehouses than you are in a small shop or home garage. Still, they are an option and worth a look. Like chain hoists, electric hoists use a set of chains to lift the engine. The big difference is electric chain hoists don’t require manual operation. They have an internal motor, which is activated by remote control and provides the lifting power. That makes the electric hoist the easiest and fastest hoist to use, and it’s ideal for shops where frequent lifting is required. Sounds great, right? So what’s the downside? Electric hoists cost significantly more than the other styles of engine hoists, especially as the weight capacity requirements go up. An “entry-level” electric hoist will have a small weight capacity and cannot be used for larger engines. As the weight ratings go up, so does the price — quite significantly! Like the chain hoist, an electric hoist also requires a mounting point. Plus, you need a nearby power source to operate it, making it the least versatile and mobile of the engine hoist designs. No matter which style of engine hoist you choose, weight capacity should be the number-one consideration. Typical weight capacities for hydraulic hoists are 1- and 2-ton, although there are bulkier hoists for larger engines. Chain hoists usually have lower weight capacity options. When selecting a hoist, we recommend going with a higher weight capacity than the actual weight of the engine. For example, many people opt for a 2-ton hoist even though most car engines don’t weight that much. This is because physics tells us the actual weight capability of the hoist can drop as you extend out the engine hoist’s boom. Some manufacturers provide weight ratings with the boom extended to different lengths. There is one more thing you should know before making your decision. If you opt to go with the popular hydraulic design, you’ll be faced with one last choice: foldable or non-foldable. The fold up hoist has become popular as they can be folded up and stored out of the way, saving valuable garage space in the process. For most DIYers, this is a definite plus. There you have three simple considerations when choosing an engine hoist. I am in need of a replacement of my engine hoist but really like to buy one MADE IN THE USA! Thanks. Good summary but I am concerned that my engine will clear a 3 ft height up & over my radiator cross bar if using a 1 ton foldable shop crane as advertised by Harbor Freight.